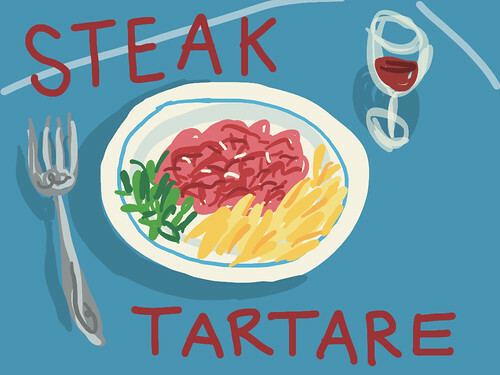 Tartare, originally uploaded by Lobstersquad. Aren't you glad I'm going to spare you a bunch of fuzzy edged high contrast yellowed out Instagram pics? I don't even have any sketches, because it was very cold and stopping for even a second was impossible. We walked and walked and it was lovely because it always is. And like I always do I had steak tartare and it was beautiful. Next up, a proper post about cocido madrileño, to counteract all this francophilia. Posted by lobstersquad at 1:07 p. m.
And what a steak tartar it was, a light red, so light it was closer to pink than red, and the smothest softest texture in the mouth, and of course delightfully dressed, respecting every flavour. Best I've had.